A lovely Sunday afternoon in late June and the annual Loon Lake Youth Fishing Tournament is coming to a close. People are happy, kids full of ice cream and teenagers setting off firecrackers so loud no one hears the gunshot. But when the crowd thins out an attractive young wife makes a grisly discovery: A single bullet to the brain has killed her much-older husband--the richest man in Wisconsin. Just as Loon Lake Police Chief Lewellyn Ferris gets the murder investigation underway, her good friend and deputy coroner, "Doc" Osborne, is alarmed to hear his oldest grandchild, fifteen-year-old Beth, has been caught in a drug sting. And Loon Lake's idyllic summer is further shattered when numerous elderly patients in Loon Lake's nursing home discover they have been robbed. See my short story, "Death by Honey Hole," in HOOK, LINE & SINISTER, a collection edited by T. Jefferson Parker." Read a review of DEAD WATER. Read a great feature about me and the Loon Lake Fishing Mysteries. It was written by Heather Lee Schroeder who is the books editor for The Capital Times. Another great review by Judy Egner of Dallas, Texas. It's a bright summer morning in Loon Lake when Police Chief Lewellyn Ferris is called to the scene of a horrific accident that occurred in the dead of night at a local gentleman's club. The club is owned by one of the victims, a member of the private Deer Creek Fishing and Hunting Preserve and the scion of a wealthy Wisconsin family. When the county coroner is unavailable due to a car accident, Chief Ferris deputizes her close friend and fellow fly-fisherman, retired dentist "Doc" Osborne, to step in. It's the dead of winter in Loon Lake when a wealthy widow is run down and killed by a logging truck on an icy street. The truck driver insists he saw a man shove the woman into the path of his truck. A lone witness who may have seen the man who shoved the victim is soon found dead--drowned in icy waters where he was ice fishing. Within hours, Police Chief Lewellyn Ferris finds herself dealing with malicious family members related to dead woman, a cache of grisly paintings, and strange disturbances on the land surrounding the widow's contemporary mansion--all of which point to various people who may have wanted her dead. Lew recruits her close friend and fellow flyfisherman, retired dentist "Doc" Osborne, for his forensic and interrogation skills. Meanwhile, Ray Pradt, ice fishing guide and expert tracker, helps with the initial investigation even as he threatens to engage in an inappropriate relationship with a key witness. Lew's life and career is further complicated when a young woman calls convinced that Lew is her birth mother. .
It’s mid-July in Loon Lake, and Police Chief Lewellyn Ferris has her hands full with the discovery of the skeletal remains of a missing bank executive and the murder of graduate student. To complicate matters, both victims were discovered on a hidden river deep in the national forest—a place that just so happens to be a dangerous wolf rendezvous site. Lew recruits her close friend and fellow fly fisherman, retired dentist “Doc” Osborne for his forensic and interrogation skills. But Doc has his own set of problems to worry about: his grandson is hospitalized with a grave illness, and now Lew seems to be getting too interested in the father of the murdered student—a well-to-do widower who is teaching her the Japanese art of tenkara fly fishing. During an August flood, pieces of Wisconsin candidate for U.S. Senate Jane Ericsson’s dismembered body are found wrapped in butcher paper traveling down a swollen waterway near Loon Lake, Wisconsin. With the assistance of her close friend, retired dentist Dr. Paul (Doc) Osborne, Loon Lake Police Chief Lewellyn (Lew) Ferris investigates as a media circus descends around them. Suspects include an environmentalist who was trying to bribe Ericsson and a longtime friend with whom Ericsson had a recent falling out. Soon another dead victim is found. With Ericsson’s campaign manager acting oddly and a large amount of money missing from the deceased’s campaign fund, Ferris and Osborne have numerous avenues to pursue before they identify the killer. A hot August afternoon and Midwest Clinic CEO John McNeil has been working late. Working on his latest conquest, that is. Jen Williams is twenty-six, in charge of graphics for the hospital's PR division—and quite attractive in a healthy, athletic kind of way. She is quick to laugh and a little too quick to fall for guys. She is no virgin. And she is one of three women—including his wife—intimately familiar with McNeil. When Jen's youthful body is found with a single stab wound through the heart, suspicion falls on both McNeil's wife, who insists she is being stalked, and the striking hospital physician with whom he had just ended an affair. Pressure to find the killer falls on Loon Lake Police Chief Lewellyn Lew" Ferris and Dr. Paul "Doc" Osborne, the retired dentist and forensic dental expert whom she has deputized to help with the investigation—when they are not taking a break for fishing and other personal pursuits. When the mayor demands Lew take early retirement—and Doc has to babysit his teenage granddaughter who won't stop texting—the frustrations mount. It's late January in Loon Lake and bodies abound: a woman on snowshoes has been discovered wedged under a wooden bridge on a cross-country ski trail. A day later, Police Chief Lewellyn Ferris interviews a couple who alleges that the wife, a former nun, is being stalked. Meanwhile, Loon Lake is hosting an International Ice Fishing Festival with problems. A sunny Thursday heading into the Fourth of July and retired dentist Doc Osborne is helping his daughter, Erin, who has just opened her own legal practice. They are assisting an elderly client of Erin's reclaim an antique chest from an uncooperative antique dealer when Doc Osborne stumbles over a rug and human remains tumble onto the floor . . .
Ninth in the Loon Lake Mysteries Murder never takes a holiday . . . or so Loon Lake learns one wintry Thanksgiving Day. Chief of Police Lew Ferris, short-handed thanks to an AWOL coroner, never even gets the turkey stuffed before the bodies start to surface. By the end of the day, credit card theft and dysfunctional families have so muddied the waters that not even expert tracker and dedicated fishing guide, Ray Pradt, can hope to fish the final day of muskie season. And while retired dentist, Doc Osbornse, had counted on sitting by the fire with Lew (out of uniform) and planning a fly fishing trip to Wyoming-the unexpected arrival of Gina Palmer, former investigative reporter turned forensics database expert, ramps up the action with her pursuit of a Canadian link to the theft of merchandise from stores across the upper Midwest. Dead Hot Shot, ninth in the Loon Lake Mystery series, is a heady mix of murder, mayhem and fishing in the northwoods of Wisconsin. 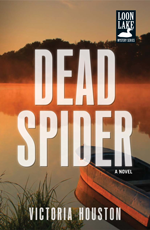 When the body of a lovely young woman is found floating beneath a party pontoon on a popular lake in northern Wisconsin on the same morning that a prominent widow is found bludgeoned in her gracious home, Loon Lake Police Chief Lew Ferris is caught short-handed. This is not a problem for Doc Osborne whom she deputizes to act as coroner and to assist with the investigation. Fishing aside, there’s nothing Osborne likes better than helping Lew -- a world-class fly fisherman in her own right – delve into Loon Lake’s criminal underworld. They’re joined in their efforts to untangle two seemingly unrelated murders by walleye-expert, talented tracker and teller of really bad jokes, Ray Pradt. A charming resort town on the surface, life in Loon Lake turns murky as bank officials soon discover that both victims’ accounts have been looted – along with a dozen others. One grisly development after another further links the two murders even though the victims did not know each other. Wealthy Chicagoans, visiting entrepreneurs and the young denizens of “Party Cove” complicate the scene. Whoever thought life in the Northwoods could be this dangerous? Peg Garmin was not Loon Lake’s most beloved citizen. Considering her “calling” in life, no one was completely surprised when she was found murdered in the company of two exotic dancers…no one, that is, except for Ray Pradt, Peg’s dearest friend. As the team digs into the mysery of her past, they discover some startling connections to one of the wealthiest families in Chicago and to the buried secret that could destroy them. Now Lew, Osborne and Ray must root the skeletons out of the Garmin family closet before Peg’s killer becomes the one who got away…. Everyone knows the name Hope McDonald – and not just the couple thousand folks in Loon Lake. Her advice column is syndicated worldwide to about eighty million readers. When the wise old woman is found murdered in her home, Chief Lew Ferris can think of more than a few suspects – and calls on Doc Osborne for help. Since Hope was dealing with some desperate souls, Doc and Lew will have to think of the perfect bait to net a cold-blooded killer…. For fishing pals (or are they more than just pals?) Doc Osborne and Police Chief Lew Ferris, Loon Lake, Wisconsin, is usually a great place to seek out some mutual solitude in the trout stream. But lately the town has been teeming with competitive bass fishermen and bikers ­ too many less-than-savory characters. Meanwhile, there¹s an old murder case, Doc¹s bent on solving even as he himself is stalked by a mysterious visitor. A motorcycle rally, bass fishing tournament, illicit drugs and very expensive antique fishing lures make for a dangerous mix ­ reminding Doc and Chief Ferris that the secrets of the northwoods can be hidden in places you least suspect. Whether the death is accidental -- or accidentally on purpose -- Lewellyn is determined to rell in the truth. She enlists Pail and his walleye-expert buddy, Ray, to help her get to the bottom of the murky mystery. Whoever thought small-town retirement could be this dangerous? Recent news stories have hailed the benefits of estrogen/testosterone combination therapy-but leave many questions unanswered. Written by an experienced doctor and a woman whose life has been transformed by testosterone therapy, Restore Yourself educates women on how the so-called "male" hormone can help them rekindle desire-before, during, and after menopause. © 2006-2018 Victoria Houston, all rights reserved.